The Society of Jesus (SJ; Latin: Societas Iesu) is a scholarly religious congregation of the Catholic Church for men founded by Ignatius of Loyola and approved by Pope Paul III. The members are called Jesuits ( Latin: Iesuitæ). The society is engaged in evangelization and apostolic ministry in 112 nations. Jesuits work in education, intellectual research, and cultural pursuits. Jesuits also give retreats, minister in hospitals and parishes, sponsor direct social ministries, and promote ecumenical dialogue. Ignatius was a nobleman who had a military background, and the members of the society were supposed to accept orders anywhere in the world, where they might be required to live in extreme conditions. Accordingly, the opening lines of the founding document declared that the society was founded for "whoever desires to serve as a soldier of God [a] to strive especially for the defence and propagation of the faith and for the progress of souls in Christian life and doctrine." Jesuits are thus sometimes referred to colloquially as "God's soldiers",  "God's marines",  or "the Company", which evolved from references to Ignatius' history as a soldier and the society's commitment to accepting orders anywhere and to endure any conditions. The society participated in the Counter-Reformation and, later, in the implementation of the Second Vatican Council. The Society of Jesus is consecrated under the patronage of Madonna Della Strada, a title of the Blessed Virgin Mary, and it is led by a Superior General. The headquarters of the society, its General Curia, is in Rome. 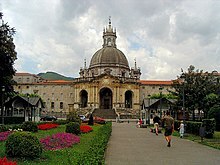 The historic curia of Ignatius is now part of the Collegio del Gesù attached to the Church of the Gesù, the Jesuit mother church. In fulfilling the mission of the "Formula of the Institute of the Society", the first Jesuits concentrated on a few key activities. First, they founded schools throughout Europe. Jesuit teachers were trained in both classical studies and theology, and their schools reflected this. Second, they sent out missionaries across the globe to evangelize those peoples who had not yet heard the Gospel, founding missions in widely diverse regions such as modern-day Paraguay, Japan, Ontario, and Ethiopia. 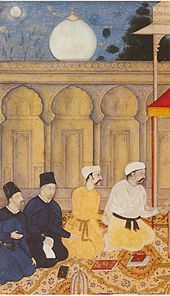 One of the original seven arrived in India already in 1541. Finally, though not initially formed for the purpose, they aimed to stop Protestantism from spreading and to preserve communion with Rome and the successor of Saint Peter. 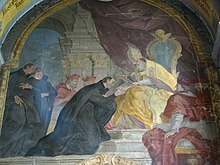 The zeal of the Jesuits overcame the movement toward Protestantism in the Polish–Lithuanian Commonwealth and southern Germany. 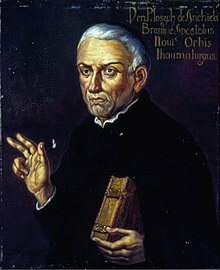 Jesuit scholars working in foreign missions were very important in studying their languages and strove to produce Latinized grammars and dictionaries. This included: Japanese (see Nippo jisho also known as Vocabvlario da Lingoa de Iapam, Vocabulary of the Japanese Language, a Japanese–Portuguese dictionary written 1603); Vietnamese (Portuguese missionaries created the Vietnamese alphabet,   which was later formalized by Avignon missionary Alexandre de Rhodes with his 1651 trilingual dictionary); Tupi (the main language of Brazil); and the pioneering study of Sanskrit in the West by Jean François Pons in the 1740s. 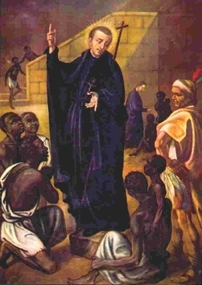 Jesuit missionaries were active among indigenous peoples in New France in North America, many of them compiling dictionaries or glossaries of the First Nations and Native American languages they had learned. For instance, before his death in 1708, Jacques Gravier, vicar general of the Illinois Mission in the Mississippi River valley, compiled a Kaskaskia Illinois–French dictionary, considered the most extensive among works of the missionaries. Extensive documentation was left in the form of The Jesuit Relations, published annually from 1632 until 1673. 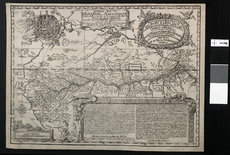 During the French colonisation of New France in the 17th century, Jesuits played an active role in North America. When Samuel de Champlain established the foundations of the French colony at Québec, he was aware of native tribes who possessed their own languages, customs, and traditions. These natives that inhabited modern day Ontario, Québec, and the areas around Lake Simcoe and Georgian Bay were the Montagnais, the Algonquins, and the Huron. 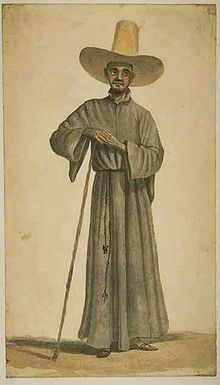 Champlain believed that these had souls to be saved, so in 1614 he initially obtained the Recollects, a reform branch of the Franciscans in France, to convert the native inhabitants. In 1624 the French Recollects realized the magnitude of their task  and sent a delegate to France to invite the Society of Jesus to help with this mission. 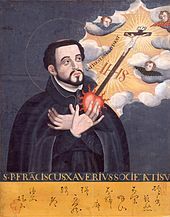 The invitation was accepted, and Jesuits Jean de Brébeuf, Ennemond Masse, and Charles Lalemant arrived in Quebec in 1625. Lalemant is considered to have been the first author of one of the Jesuit Relations of New France, which chronicled their evangelization during the seventeenth century. 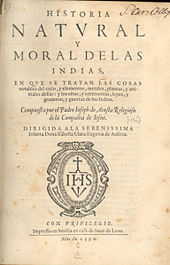 The Jesuits operated their properties as an integrated unit with the larger Jesuit order; thus revenues from haciendas funded their colegios. 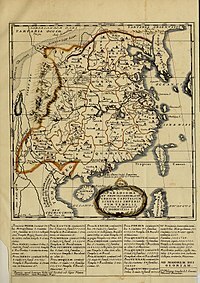 Jesuits did significantly expand missions to the indigenous in the northern frontier area and a number were martyred, but the crown supported those missions. Mendicant orders that had real estate were less economically integrated, so that some individual houses were wealthy while others struggled economically. The Franciscans, who were founded as an order embracing poverty, did not accumulate real estate, unlike the Augustinians and Dominicans in Mexico. The Jesuits engaged in conflict with the episcopal hierarchy over the question of payment of tithes, the ten percent tax on agriculture levied on landed estates for support of the church hierarchy from bishops and cathedral chapters to parish priests. Since the Jesuits were the largest religious order holding real estate, surpassing the Dominicans and Augustinians who had accumulated significant property, this was no small matter. They argued that they were exempt, due to special pontifical privileges. 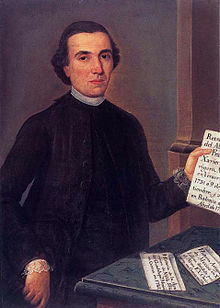 In the mid-seventeenth century, bishop of Puebla, Don Juan de Palafox took on the Jesuits over this matter and was so soundly defeated that he was recalled to Spain, where he became the bishop of the minor diocese of Osma. Under Superior General Pedro Arrupe, social justice and the preferential option for the poor emerged as dominant themes of the work of the Jesuits. When Arrupe was paralyzed by a stroke in 1981, Pope John Paul II, not entirely pleased with the progressive turn of the Jesuits, took the unusual step of appointing the venerable and aged Paolo Dezza for an interim to oversee "the authentic renewal of the Church",  instead of the progressive American priest Vincent O'Keefe whom Arrupe had preferred. In 1983 John Paul gave leave for the Jesuits to appoint a successor to Arrupe. The society is divided into geographic provinces, each of which is headed by a Provincial Superior, generally called Father Provincial, chosen by the General. He has authority over all Jesuits and ministries in his area, and is assisted by a socius who acts as a sort of secretary and chief of staff. With the approval of the General, the provincial appoints a novice master and a master of tertians to oversee formation, and rectors of local communities of Jesuits. For better cooperation and apostolic efficacy in each continent, the Jesuit provinces are grouped into six Jesuit Conferences worldwide. Today, most Jesuits in the United States wear the clerical collar and black clothing of ordinary priests, although some still wear the black cassock. Jesuits in tropical countries may use a white cassock when ministering outdoors. The Jesuits were temporarily banished from France in 1594 after a man named Jean Châtel tried to assassinate the king of France, Henri IV. 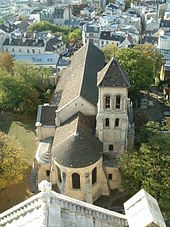 Under questioning, Châtel revealed that he had been educated by the Jesuits of the Collège de Clermont. The Jesuits were accused of inspiring Châtel's attack. Two of his former teachers were exiled and a third was hanged. The Collège de Clermont was closed, and the building was confiscated. The Jesuits were banned from France, although this ban was quickly lifted. Within the Roman Catholic Church, there has existed a sometimes tense relationship between Jesuits and the Holy See due to questioning of official church teaching and papal directives, such as those on abortion,   birth control,     women deacons,  homosexuality, and liberation theology. Usually, this theological free thinking is academically oriented, being prevalent at the university level. From this standpoint, the function of this debate is less to challenge the magisterium than to publicize the results of historical research or to illustrate the church's ability to compromise in a pluralist society based on shared values that do not always align with religious teachings. This has not prevented Popes from appointing Jesuits to powerful positions in the church. John Paul II and Benedict XVI together appointed ten Jesuit cardinals to notable jobs. Under Benedict, Archbishop Luis Ladaria Ferrer was Secretary of the Congregation for the Doctrine of the Faith and Federico Lombardi was Vatican Press Secretary. The current Pope, Francis, is himself a Jesuit. Several other Jesuits are known to have rescued or given refuge to Jews during that period. A plaque commemorating the 152 Jesuit priests who gave of their lives during the Holocaust was installed in April 2007 at the Jesuits' Rockhurst University in Kansas City, Missouri, United States. 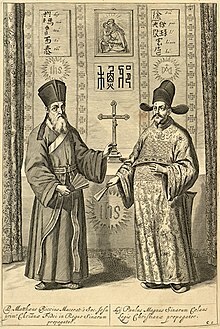 The Jesuit China missions of the 16th and 17th centuries introduced Western science and astronomy. 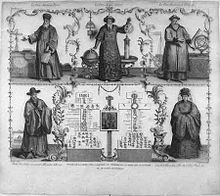 One modern historian writes that in late Ming courts, the Jesuits were "regarded as impressive especially for their knowledge of astronomy, calendar-making, mathematics, hydraulics, and geography." The Society of Jesus introduced, according to Thomas Woods, "a substantial body of scientific knowledge and a vast array of mental tools for understanding the physical universe, including the Euclidean geometry that made planetary motion comprehensible." 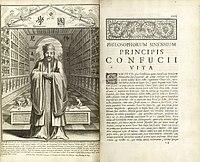 Another expert quoted by Woods said the scientific revolution brought by the Jesuits coincided with a time when science was at a very low level in China. 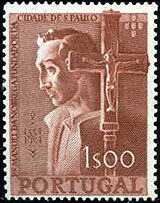 Baltasar Gracián was a 17th-century Spanish Jesuit and baroque prose writer and philosopher. He was born in Belmonte, near Calatayud ( Aragon). His writings, particularly El Criticón (1651-7) and Oráculo Manual y Arte de Prudencia ("The Art of Prudence", 1647) were lauded by Schopenhauer and Nietzsche. Since the Second Vatican Council and their own General Congregations which followed it, Jesuits have become increasingly involved in works directed primarily toward social and economic development for the poor and marginalized. Included in this would be research, training, advocacy, and action for human development, as well as direct services. Most Jesuit schools have an office that fosters social awareness and social service in the classroom and through extracurricular programs, usually detailed on their websites. The Jesuits also run over 500 notable or stand-alone social or economic development centres in 56 countries around the world. ^ "Time Magazine on "Men for Others"". America Magazine. 2009-11-10. Retrieved 2017-05-30. 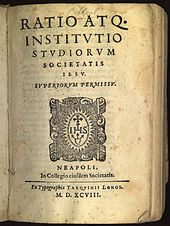 ^ a b Text of the Formula of the Institute as approved by Pope Paul III in 1540[ permanent dead link], Boston College, Institute for Advanced Jesuit Studies. ^ "Chapter 2". www.reformation.org. Retrieved 2017-05-30. ^ Jacques, Roland (2004). " Bồ Đào Nha và công trình sáng chế chữ quốc ngữ: Phải chăng cần viết lại lịch sử?" Translated by Nguyễn Đăng Trúc. In Các nhà truyền giáo Bồ Đào Nha và thời kỳ đầu của Giáo hội Công giáo Việt Nam (Quyển 1) – Les missionnaires portugais et les débuts de l’Eglise catholique au Viêt-nam (Tome 1) (in Vietnamese & French). Reichstett, France: Định Hướng Tùng Thư. ISBN 2-912554-26-8. ^ "The American Catholic quarterly review". archive.org. p. 244. Retrieved 2017-05-31. ^ a b Charbonnier, Jean-Pierre (2007), Couve de Murville, Maurice Noël Léon, ed., Christians in China: AD 600 to 2000, San Francisco: Ignatius Press, pp. 256–62 . ^ Ott, Michael (1913), " Charles-Thomas Maillard de Tournon", Catholic Encyclopedia, Vol. XV, New York: Encyclopedia Press . ^ "The Jesuit Missions in South America: Jesuits Reductions in Paraguay, Argentina, Brazil - Colonial Voyage". www.colonialvoyage.com. Retrieved 2017-05-31. ^ "Dominus ac Redemptor Noster". www.reformation.org. Retrieved 2017-05-31. ^ "20 December 1999, Eulogy for His Eminence Cardinal Paolo Dezza | John Paul II". w2.vatican.va. Retrieved 2017-05-31. ^ "Religion: John Paul Takes On the Jesuits". Time. 1981-11-09. ISSN 0040-781X. Retrieved 2017-05-31. ^ "Rev. Thomas J. Reese, S.J., Chair". United States Commission on International Religious Freedom. 2014-05-19. Retrieved 2017-06-01. ^ "To the Fathers of the General Congregation of the Society of Jesus (February 21, 2008) | BENEDICT XVI". w2.vatican.va. Retrieved 2017-05-31. ^ a b "To understand Pope Francis, look to the Jesuits". National Catholic Reporter. 2014-03-12. Retrieved 2017-05-30. ^ "Pope Francis and the Dirty War". The New Yorker. 2013-03-14. Retrieved 2017-06-01. ^ "Vatican, Argentine church to open "dirty war" archives". Crux. 2016-10-25. Retrieved 2017-06-01. ^ "General Congregation 36". jesuits.org. Retrieved 2017-05-30. ^ enquiries@thetablet.co.uk, The Tablet - w:. "Dominican Master urges Jesuits to adopt 'audacity and humility' in electing Superior General". www.thetablet.co.uk. Retrieved 2017-05-30. 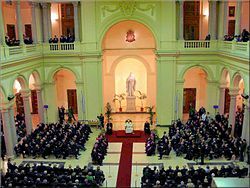 ^ "The first session in the aula and Father Nicolás' resignation - General Congregation 36". General Congregation 36. 2016-10-03. Retrieved 2017-05-30. ^ "Jesuits elect first Latin-American general". Crux. 2016-10-14. Retrieved 2017-05-30. ^ "Pope Francis approves four priorities for the Jesuits' next decade". America Magazine. 2019-02-19. Retrieved 2019-02-20. ^ a b "Father General's House". www.sjweb.info. Retrieved 2017-05-30. ^ "USA Assistancy". www.sjweb.info. Archived from the original on 2008-05-16. Retrieved 2017-05-30. ^ "The Society of Jesus in the United States: Frequently Asked Questions". Jesuit.org. 2008-01-19. Retrieved 2013-03-18. ^ "Pontiff Praises a Bavarian Foe of Nazism". Zenit News Agency. Retrieved 2013-11-06. ^ "Library : The Gentile Holocaust". Catholic Culture. Retrieved 2013-11-06. 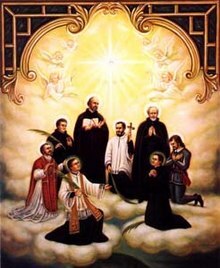 ^ "November 5: Feast of all Jesuit Saints and Blessed | European Tertianship". tertianship.eu. Retrieved 2017-05-30. ^ "4th Decree". onlineministries.creighton.edu. Retrieved 2017-05-30. Adelaar, Willem F. H. (2004). "Review of Kaskaskia Illinois-to-French Dictionary edited by Carl Masthay". International Journal of Lexicography. 17 (3): 325–327. doi: 10.1093/ijl/17.3.325. ISSN 1477-4577. 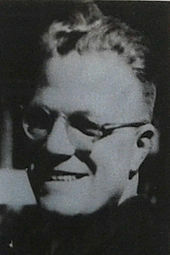 Ashworth, William B. (1986). "Catholicism and Early Modern Science". In Lindberg, David C.; Numbers, Ronald L. God and Nature: Historical Essays on the Encounter between Christianity and Science. Berkeley, California: University of California Press. ISBN 978-0-520-05538-4. Cline, Sarah L. (1997). "Church and State: Habsburg New Spain". In Werner, Michael S. Encyclopedia of Mexico: History, Society & Culture. 1. Chicago: Fitzroy Dearborn Publishers. ISBN 978-1-884964-31-2. Gerard, John (1911). "Monita Secreta" . In Herbermann, Charles. Catholic Encyclopedia. 10. New York: Robert Appleton Company. ——— (2006). "Introduction". In O'Malley, John W.; Bailey, Gauvin Alexander; Harris, Steven J.; Kennedy, T. Frank. The Jesuits II: Cultures, Sciences, and the Arts, 1540–1773. University of Toronto Press. ISBN 978-0-8020-3861-6. Pollard, John (2006). "Jesuits, The". In Blamires, Cyprian P. World Fascism: A Historical Encyclopedia. 1. Santa Barbara, California: ABC-CLIO. pp. 356–357. ISBN 978-1-57607-940-9. Pollen, John Hungerford (1912). "Society of Jesus" . In Herbermann, Charles. Catholic Encyclopedia. 14. New York: Robert Appleton Company. Sacks, Richard S. (1990). "Historical Setting". In Hanratty, Dennis M.; Meditz, Sandra. Paraguay: A Country Study (PDF). Area Handbook Series (2nd ed.). Washington: U.S. Government Printing Office. pp. 1–49. Retrieved 18 June 2017. Sandoval, Alonso de (2008). Von Germeten, Nicole, ed. Treatise on Slavery: Selections from De Instauranda Aethiopum Salute. Translated by von Germeten, Nicole. Indianapolis, Indiana: Hackett Publishing Company. ISBN 978-0-87220-929-9. Warren, J. Benedict (1973). "An Introductory Survey of Secular Writings in the European Tradition on Colonial Middle America, 1503–1818". In Cline, Howard F. Handbook of Middle American Indians. Volume 13: Guide to Ethnohistorical Sources, Part Two. Austin, Texas: University of Texas Press (published 2015). pp. 42–137. ISBN 978-1-4773-0683-3.
" Society of Jesus" section of Wikisource's Roman Catholicism portal.